Strong in the beginning, the alcohol is noticeable. He needs some time in the glass to open. Honey, vanilla, malt, peach and marzipan. Again, the first alcohol present and pricklet on the tongue. After the salivation has begun I find honey, malt and slightly dry oak. Hui, he has power. Nice fresh in the nose and if you have grown used to the 62.1%, clearly vanilla and caramel flavors come to light. I can also spot tangerines and peaches, which are aided by green apple water. Subtle honey sweetness, vanilla, ginger, you can feel the alcohol. This manifests itself in a pleasant tingling on the tongue, no burning, no scratching. Over time, the bright fruits are plowing their way again, revealing delicate tangerines and apple notes, which benefit from a splash of water. Finish: medium, malty, mineral, and again mandarins (a great alliteration). At the beginning, slightly nutty and grainy. With time comes more and more sweetness and vanilla. A hint of roasted almonds. In addition, some apple and subtle a hint of orange. The alcohol does not bite in any way. Dry-sweet onset. It comes a little bit peppery at the beginning, but it decreases quickly. Vanilla and honey are becoming more and more prevalent. In addition, green apple and young sugar melon. Gradually, the nutty note comes along with a woody spice. Medium long, warming with sweetness and light spice. 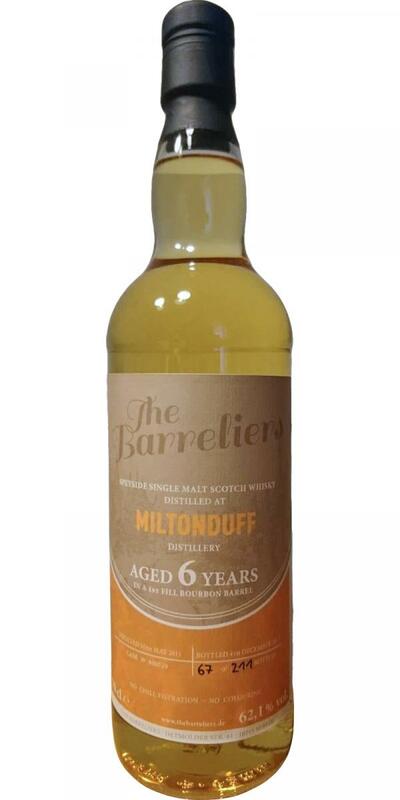 This young Miltonduff is very strong which one would expect due to its high alcohol content. 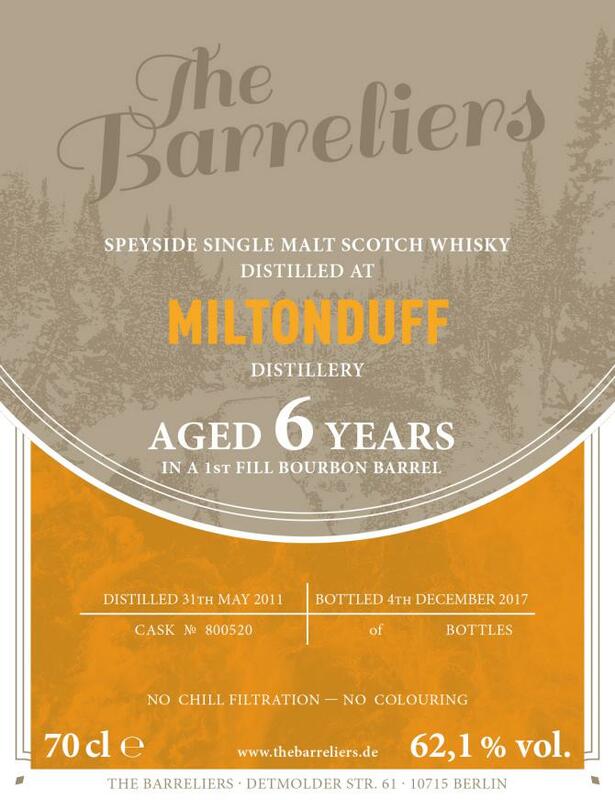 But the first-fill Bourbon barrel provides beautiful, almost tropical fruit notes, which complement nicely with the sweet vanilla and the toffee/caramel flavours to a harmonious dram. This is kept in a beautiful balance by the oak spice. Despite the 62%, abv this one tasted much better to me neat than diluted. A well-chosen, young, wild but mature looking single malt. I thank The Barreliers for the complimentary sample! The nose starts off with a potpourri of vanilla, apricots, yellow apples and bananas. Lingering notes of toffee arrive, nicely mixed with blossom honey and a hint of oak spice in the back. The alcohol is already well integrated and not pungent at all. Sweet and fruity on the palate with a delicate mix of mainly apples and apricots. Now the high alcohol content becomes noticeable: very warm with a white pepper note, ginger spice and a hint of dry oak. Oily and creamy with vanilla and acacia honey. Very mouth-filling! The finish is long, warm and creamy with caramel and honey. Becomes drier on the tail with oak and wood tannins. With water: There's less fruit on the nose when a splash of water is added. Still sweet with vanilla and caramel. Seems to be a bit fresher with a hint of citrus in the back. Still sweet and fruity on the palate, accompanied with white pepper and oak spice. Less oily and creamy with milk chocolate and a hint of blossom honey. Less warming, too. The finish is a bit shorter and fairly dry with oak, tannins and pepper. He is young. No question. But he is really good, without any junk and in the total package worth every penny. I am more than positively surprised! I like the. I would buy as a large sample. Aroma: Warm honey meets a lot of vanilla and a fruity mix of apricots, bananas and apples. In the background are notes of caramel. Taste: Very oily and creamy. Honey, malt and apples. Getting drier with time. Finish: Slightly dry. Caramel sweet and some oak. Honest, tasty young whisky with good value for money. Sweet and spicy at the same time. Honey and vanilla meet grains and cereals. After the first sip he becomes fruity. Shows apricot and banana. The alcohol is super involved. Strong onset but pleasantly creamy in consistency. Spicy honey. Cocoa. Some oak on the palate. Drying. Some cocoa powder. Remains mild and does not look metallic. A great 6-year-old ... who still lacks a bit of complexity - where should he have her out !! !